I once went to a Reiki Share where ten people shared one table (very awkward physically and uncomfortable energetically) and I suggest you stay away from that kind of arrangement. People without any Reiki teaching may want to come to an Exchange as a way to satisfy their curiosity. The best way to accommodate this is to give them a group treatment first and then that person can leave, feeling very well treated. Joining in would be strange and leave that person with many questions and needing guidance and you may feel the responsibility to teach an instant mini-class in order to be able to include someone into the Reiki Share. At a Reiki Exchange I once attended, a kind and curious person without any Reiki was invited for the duration and one of the participants decided that this person needed "a quickie attunement", in fron tof us all, no less and the grand-standing that ensued was uncomfortable for all. Another visitor at a Reiki exchange was left with the true feeling that there really was nothing to it if after all, if one can just join right in without instruction. Evenings and weekends are the easiest times to gather people. When I was hosting large Quantum Touch healing circles, I took a vote and Saturday was the favourite day and the time of day of 3:00pm won out over 10:00am! Coming on time is important and starting on time gets people to arrive on time. After a Reiki Share / Exchange is over, some people like to sit and chat and connect and socialize and ask questions. It's always nice to share juice/tea/healthy snacks and good conversation (no gossip). Those remaining may wish to send long-distance healing to loved ones, fellow participants, pets, or situations. I always have a guided meditation on hand - and that tends to signal that we are wrapping up. The snacks and drinks are not a great expense and just providing them (as little as several $'s per participant) is easiest. When people are all asked to bring snacks then there is a resulting bottle neck and fussing in the kitchen with this pot-luck snack business. So I suggest it just gets "handled" by you. I believe that the snacks should be high quality - it reflects how you feel about the people who have gathered and Reiki - respectfulness all round. And so if money is tight, you can ask for a donation of, say, $5 or $10, or whatever the expense is, per person, then all is covered. If room rental is also to be covered then a double digit dollar donation is surely appropriate. I believe that the effort that is involved in keeping these exchanges going is priceless and is part of being in service and as a way to help us grow and experience. Some shares start on a gentle note with a guided meditation, a prayer of intent or an energy exercise for the chakras. You can also call upon your guides, angels, Ascended Masters (not Reiki but might make some people more comfortable). Not all studenrts of Reiki are trained in the same manner - so we leave things open. Leaving the daily frustrations and negative thoughts outside and having positive healing thoughts in the Reiki circle is important and we need to do whatever feels best to bring this about, usually by setting an example. (I have the Tibetan gongs of Richard Hite playing in the background for the first while.) One person can be designated as being on "latecomers watch" and can make sure that the openin meditation is not disrupted. And experimenting with different ways to end the gathering is fun! And some of us just can't do without candles and special music! Any place to host a gathering is good - the cosier and quieter, the better - best when there are no pets and children passing through, unless they are part of the healing circle. Decent parking and near-ness of public transportation are also a bonus. When it is a residence, you will need a room to work with that allows people to move around easily and then a room to sit and chat (living room, maybe). When a public place is your choice, then make sure that the next generation of U2 is not practising in the room next-door! No kidding - it happened! The biggest unseen element in the creation of an energy work Exchange is persistence. The host has to make a commitment to invite, invite, invite! And to stick with it such that Teflon gets new meaning! People sometimes tell others; people sometimes remind friends; people sometimes remind themselves; people sometimes are too tired or feeling too miserable to get up and go; people have a lot on their minds. The host will have to stick to the emails / phoning / flyers routine very diligently. Flyers and advertising can be placed in appropriate places, bulletin boards, in your everyday email signature, many on-line calendars over and over. Always ask where a new person saw or heard about your gathering. And the best part is that usually the host doesn't have to drive to get there! If you ever wonder if it is worthwhile to expend the energy on organizing Reiki Shares - then just step up to the plate! It is an amazing gift to offer - a gift that all share in: healing, knowledge, guidance and love. 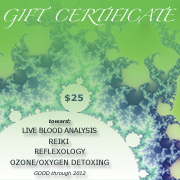 Buy a gift certificate for someone you love. Gift certificates can be for the exact amount of the session or class or any amount towards a session or class of your choosing.